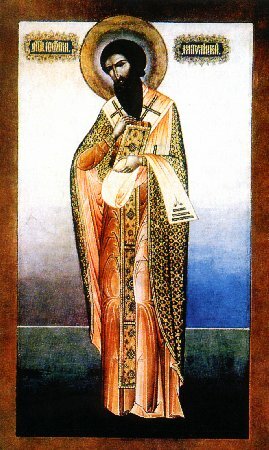 The Monk George, Metropolitan of Mytilene, from his youth led a monastic manner of life, having become especially accomplished in the virtue of wise-humility. In the reign of Leo the Isaurian (716-741) the saint underwent persecution from the iconoclasts and received the appellation Confessor. During the years of the reign of the emperor Constantine Porphyrogenitos (780‑797) Saint George was elevated onto the archbishopal cathedra of the city of Mytilene, situated on the island of Lesbos. The life of the saint was radiant with prudence and purity and resembled Angelic life. He possessed a gift of wonderworking, cast out unclean spirits and healed incurable diseases. The saint distinguished himself by compassion, and generously he helped all the needy. Towards the end of his life – in the year 815, during the reign of the iconoclast Leo the Armenian (813-820), the holy archpastor was banished and sent to Chersonesus, where he died after the year 820. In the hour of his death over the city of Mytilene there shone a bright star in the heavens.